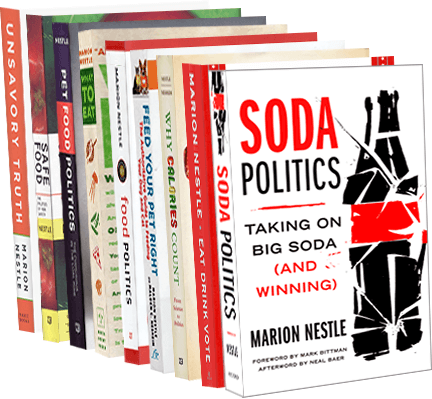 The Center for Science in the Public Interest has a new report out, Sodas on the Menu. It’s got some good news (we need some). Restaurants are making progress on cutting back sodas offered with kids’ meals. More progress is needed, of course, but on that cheerful thought, have a great August weekend. Paul Freedman. Ten Restaurants that Changed America. Liveright/WW Norton, 2016. Is it even remotely possible that ten restaurants—from Delmonico’s to Howard Johnson, Sylvia’s, and Chez Panisse—could change the way America eats? 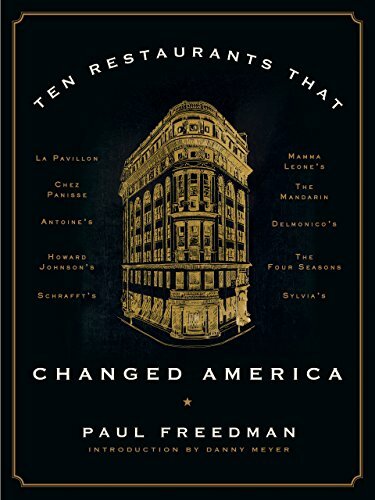 Paul Freedman draws on deep historical research, analysis of contemporary sources, and interviews with surviving players to give us an elegantly written, fascinating, and, dare I suggest, gossipy account of the individuals and social trends that made these restaurants famous. Whether or not you’ve ever eaten in any of these restaurants, you will have a wonderful time reading this book and will gain unexpectedly delightful insights into modern American life. [I]t is hardly as if American high-end restaurants have become that much more democratic. Although it is customary to begin any account of the modern restaurant boom by conjuring up the bad old days of damask tablecloths, dress code, leather-covered menus and haughty maîtres-d’-hôtel, restaurants today impose distinctions that would never have occurred to Henri Soulé: near-impossible reservations, no reservations, the speakeasy restaurant type with no visible sign, special telephone lines for favored customers, or forcing clients to pay in advance of their meal. The model is no longer the nightclub of the Copacabana or El Morocco type, but the culinary version of a dance club complete with velvet rope and line of suppliants, lacking only a bouncer. President John F. Kennedy’s forty-fifth birthday on May 19, 1962, was celebrated there. Guests, who contributed $1,000, had a rather modest meal of baked crab, chicken broth with spring wheat, beef medallions and birthday cake. Kennedy had spent so much time chatting with each table, had time only for cream of asparagus soup and a beer before going off to Madison Square Garden where Marilyn Monroe sang him a rather suggestive version of “Happy Birthday. That comment ought to take you right to YouTube, where you can the “suggestive version” for yourself. I was at an Olive Garden last night and, while I greatly appreciated the calorie labeling, which prevented me from ordering the 1,480 calorie entree I was hankering after, I was unsettled by the promotional materials urging us to order two entrees for the price of one (you’re supposed to take one home…). She includes this link to the two-for-one offer (Oops. It’s no longer available. Whew). Comment: OK, they offered customers a choice. But unlimited breadsticks and two Fettucine Alfredos? I’m going to be doing some catching up on reading over the summer, starting with this one. Saru Jayaraman. Behind the Kitchen Door. ILR Press/Cornell, 2013. This shocking, hugely important book takes a compassionate yet tough-minded look at the working conditions of restaurant workers—the poorly paid ($2.13 an hour), largely invisible people who wash dishes, clear tables, and mop the floors of the places from high end to low where many of us eat our meals. Their work is not covered by federal labor laws. When people ask what are the most important changes that we could make to our food system right away, I reply: Enforce the nation’s labor laws and increase the minimum wage. Think of that the next time you go out and eat. And what you can do to support these goals. Question: When you go out to eat, how can you estimate the amount of butter and grease that is used to cook vegetables? How does this detract from the nutritional value of the food? Answer: If you are eating out, guessing the amount of anything in food calories or fat is next to impossible. You cannot guess accurately unless you are in the kitchen watching what goes into your food, looking up the composition of each ingredient and adding up the nutrients. If you want to try this, the U.S. Department of Agriculture food composition tables are at ndb.nal.usda.gov. I like a little butter or olive oil on my vegetables. Fat brings out taste and makes vegetables taste delicious. Fat does other good things to vegetables. Without some fat in your diet, you will not be able to absorb and use beta-carotene and other fat-soluble nutrients. From a quantitative standpoint, fat provides twice the calories per unit weight than do either protein or carbohydrate. A tablespoon of fat provides about 100 calories. A tablespoon of sugar gives about 45 calories. That kind of fat is important to health. All food fats — no exceptions — are mixtures of saturated, unsaturated and polyunsaturated fatty acids but proportions differ. Animal fats like butter are more highly saturated than salad oils. As for quality, grease sounds pejorative so I assume you mean oils that have been repeatedly reused. Those are best avoided, as are those that have been partially hydrogenated, a process that introduces heart-unhealthy trans fats. How can you tell fat quantity and quality? If a food looks greasy and smells bad, don’t eat it. It’s unlikely to be good for you. Email Marion Nestle at dining@nyunews.com. Yesterday, Michele Obama announced that as part of her Let’s Move! initiative Darden’s, the restaurant chain that owns Olive Garden, Red Lobster, LongHorn Steakhouse, The Capital Grille, Bahama Breeze, and Seasons 52, would be making its meals a bit healthier. As I explain below, I have a personal interest in this announcement. Add a fruit or vegetable as the default side for every kids’ menu item at those restaurants offering a default side on the children’s menu: Bahama Breeze, LongHorn Steakhouse and Red Lobster. Make 1% milk the default beverage. Make milk prominently promoted on the menu and available with free refills. Illustrate healthy choices for meals and drinks on menus. Display healthier menu options more prominently, when possible. Not display carbonated beverages on children’s menus. Improve the nutritional content of one or more children’s menu items to provide equal or less than 600 calories, 30% of total calories from fat, 10% of total calories from saturated fat, and 600 mg of sodium. By 2016, reduce calories by 10% and over a ten-year period by 20%. By 2016, reduce sodium by 10% and over a ten-year period by 20%. My personal interest: In 2005, I was invited to Amelia Island, Florida, to give a talk to the CEO’s of popular restaurant chains, among them Clarence Otis, Jr., the CEO of Darden’s. I was specifically asked to discuss what restaurant chains could do to lessen the impact of childhood obesity. Making healthy kids’ meals the default. Parents could still order junk food, but the default meal should be healthy. Providing a price incentive for choosing smaller portions. Stopping any funding of the Center for Consumer Freedom and hiding behind its tactics. No, I simply hoped they would consider making it easier for customers to make healthier choices. Seven years later, Mrs. Obama has put these chains on notice that they are part of the problem of childhood obesity and must change their practices. Darden’s has admitted that it bears some responsibility for contributing to childhood obesity and is making some grudging changes. Others are likely to follow. It’s a step. Now let’s make sure they follow through. For more details, see the AP story. For many more details, see what Obamafoodorama has to say (I’m quoted). Margo Wootan, the nutrition policy director at Center for Science in the Public Interest (CSPI), sent along CSPI’s new materials on its Default Project—making healthy kids’ meals the default. This is a really good idea. Plenty of evidence shows that customers typically take the default whenever it is offered. The idea is that if parents order a “happy meal” for their kids, the meal is automatically a healthy one. Parents can always order junk food for their kids if they want to, so the choice is theirs. I’ve been telling restaurant chain owners to do this for years. It’s great to have the rationale explained and substantiated. Thanks Margo!